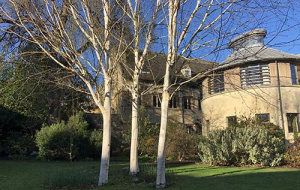 February is the month when things start appearing in the gardens, bulbs are starting to come into full display and the herbaceous plants are starting to break through the earth! For future February’s you should get wonderful displays from the two new winter gardens the Apprentices have planted at Univ, one border at the north end of the Fellows Garden and a more recent planting in Cecily’s Court. The garden in Cecily’s Court has a definite colour scheme of greys, silvers and whites. 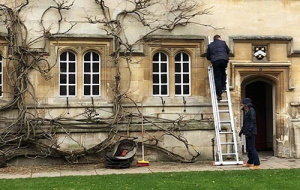 Tasks that we will be carrying out this month will be finishing off the pruning of the Wisteria’s in the Quads in readiness for that amazing display that occurs in early summer. Another sowing of Sweet Peas will be made and any that were sown in the autumn will be potted on into 9cm pots. Hardy and tender annuals can also be sown to compliment the permanent displays. Towards the end of the month Gladioli, Dahlias and Lilies can be started into growth in the greenhouse. 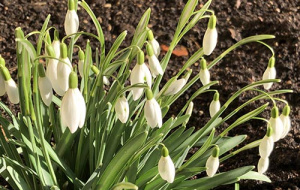 Also, a good way of increasing Snowdrops this month is by moving them “in the green”; to do this as they are finishing flowering clumps can be lifted and divided and plated elsewhere. This method as a much larger success rate than planting the dry bulbs in the autumn. Also, and a task that will be carried out by the Apprentices this month as part of their training, will be to analysis the consistency and pH of the soil throughout the College site. This is beneficial as it could determine which plants are suitable for certain areas, for example you wouldn’t grow (most) Rhododendrons in alkaline soil – soil test kits are available for this purpose. It is also a good idea to go out in the garden with a compass, it’s amazing the number of gardeners that aren’t aware which way their garden orientates, again it is vital to know this fact so that plants suitable for a certain position are grown in it. Betula utilis var.jacquemontii, the “Himalayan birch”. This medium sized tree has peeling white bark and dark green leaves that turn yellow in the autumn. In the spring it bears long yellow-brown catkins. We have a group of three planted in the Master’s Garden, a single specimen is suitable for a medium sized garden. They look particularly spectacular when viewed against a clear blue, late winter sky.